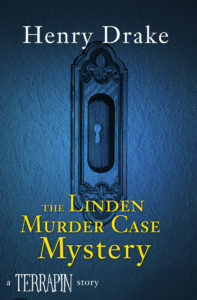 A locked room mystery that takes place in Ann Arbor, Michigan, The Linden Murder Case Mystery is connected to the 1930s S.S. Van Dine mystery stories. Authors don’t use the words “Mystery” and “Case” in the same title; it’s one or the other. You’ll have to read the story to learn why both appear in this title. Like many short mystery stories, this one is compact, breezy, and will provoke an aha and a smile from readers.